This survey and awards program was designed to identify, recognize, and honor the best employers in the plastics industry, benefiting the economy, workforce, and businesses in the United States and Canada. The list is made up of 15 companies. scores determined the top companies and the final ranking. Best Companies Group managed the overall registration and survey process, analyzed the data, and determined the final rankings. Plastics News honored all the winners and revealed the final rankings in a special ceremony at The Executive Forum on February 16 at the Naples Beach Hotel & Golf Club in Florida. The actual rankings will be published on March 21, 2016, by Plastics News. 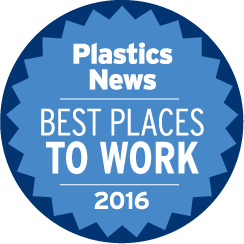 www.BestPlacestoWorkPlastics.com. Please visit www.plasticsnews.com starting on February 22, 2016, for coverage of the event and award winners.